All you need to know about packing supplies for you move. Bubble Wrap is a pliable, transparent plastic material commonly used for packing fragile items. Regularly spaced, protruding air-filled hemispheres "bubbles" provide cushioning and padding for precious or breakable items. Mattress Covers come in multiple sizes and provide great protection from dust, dirt and water stains for your mattress or box spring. Quality mattress covers are vented to prevent ballooning. A mattress cover will keep your mattresses clean during your move or while in storage. Moving Pads / Blankets are thick, heavy-duty blankets and are preferred by professional movers for protecting large items such as furniture and appliances. Moving pads are available in various sizes,colors, and qualities. Most moving companies will provided these pads for a fee, but if you decide to purchase them, make sure to purchase easy-to-wash pads that are mildew resistant. Packing Peanuts are also known as foam peanuts and are a common loose-fill packing material used to prevent damage to fragile objects by cradling them and flowing around to provide protection from all sides. Packing peanuts are available in white (regular), gray (recycled), and pink (anti-static). 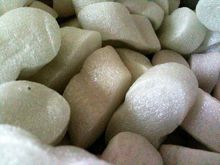 Some packing foam peanuts are environmentally friendly and will dissolve under water. Shrink Wrap provides plastic or cellophane protection to your items while in transit or storage. Use shrink wrap to attach items together and to secure moving pads to your furniture and appliances. It is also used to attach large items, such as table legs, together. Wrapping Paper is used to wrap breakable items to prevent them from breaking in the box while being moved. If you consider using old newspaper to save on wrapping costs, keep in mind that items wrapped in newspaper, will have to be washed and cleaned before you use them again as the ink on newsprint easily rubs off.